I've been keeping an eye out for inspiration for art for our entryway. When I was at JoAnn's recently, they were having a huge sale on canvases, so I bought a couple, including a small 6" x 6" canvas. 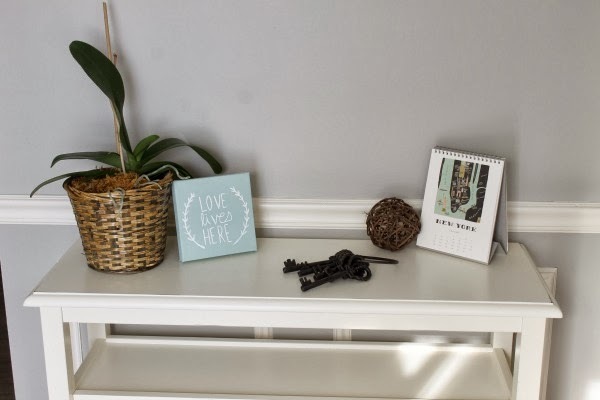 I thought it would be perfect for a small sign to lean on a shelf or on our entryway table. 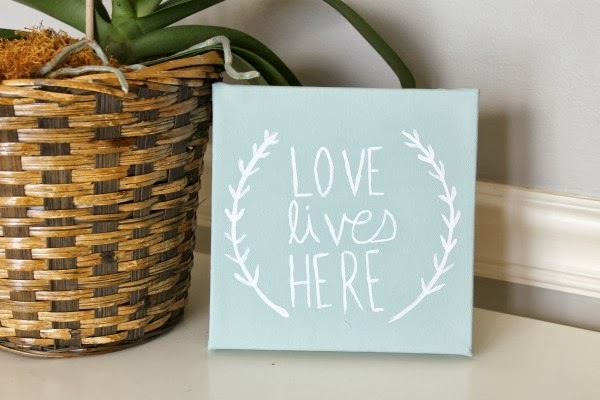 I think the "love lives here" quote would be a perfect welcoming statement when walking into someone's home, so that's what I chose. Here's how I created my sign... First prep your area. Since my canvas is small, I just used some computer paper to cover my work surface. The paint I chose is actually made for ceramics, but I wanted the texture of it. 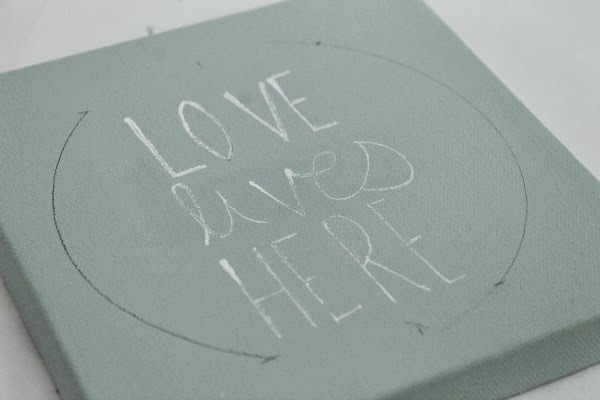 It's kind of got the feel of chalk paint. The color is a greyed down aqua because I wanted a pop of color but still somewhat neutral. 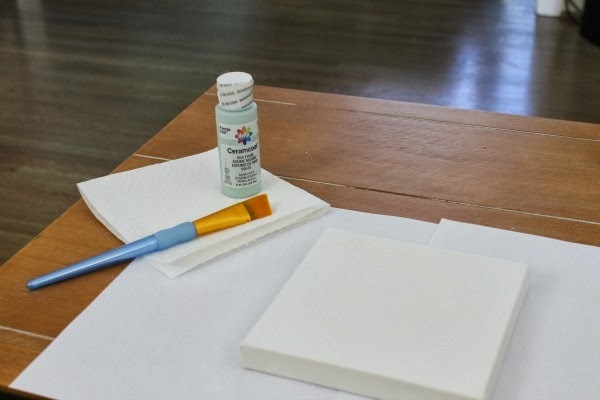 Paint the sides of your canvas first and then the front. I used two coats of paint. Next, use a pencil to create your design. That way you can erase if you mess up. I started to trace my letters with a white paint pen, but the pen was malfunctioning, so I ended up using white paint and a small brush. Lastly, I added leaves to the laurel branches. I LOVE the use of laurel branches in artwork these days. And they're perfect to set the tone for our somewhat rustic home. Tah dah!! What do you think of my new entryway art? 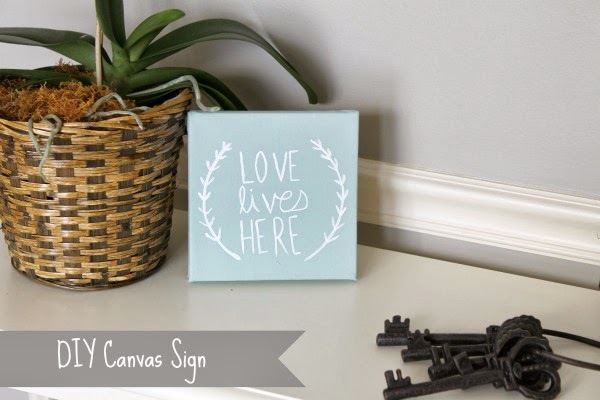 Do you have any DIY signs to share? Linking up @ Tatertots & Jello, I'm Not a Trophy Wife, The SITS Girls, Tip Junkie, and Design, Dining, and Diapers!!! Thank you! I would love to link up! This is so cute! I am working on decorating my place, I def want to try this out! Thanks for stopping by Ursula! 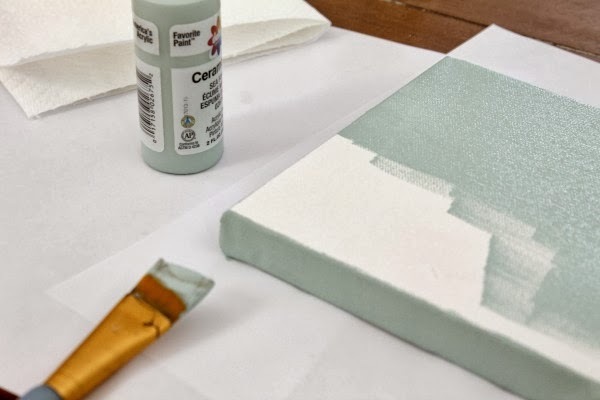 I love all shades of mint/aqua/teal/turquoise! My favorites!!! I was "drawn" to this as soon as I saw it on the Link Party Palooza and knew I wanted one for my own. You make it seem easy enough, so I am going to give it a go. Thanks so much for sharing! This is adorable! I love making my own signs to decorate with. Thank you! I love painting!! Gorgeous!! I'm pinning this--it's beautiful! We're having warm weather this week in Texas, so I decorated my mantel for Spring. 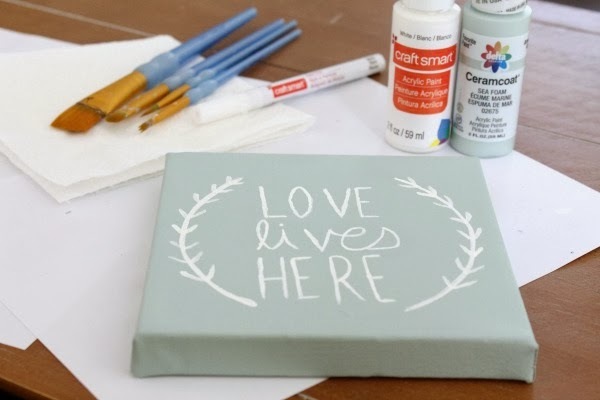 It's all in blue and white, and this canvas idea looks like a great way to add some art to it. Found you via SITS!